Goat cheese haters in your house? Just leave it off their portions. It won’t be the same, though. 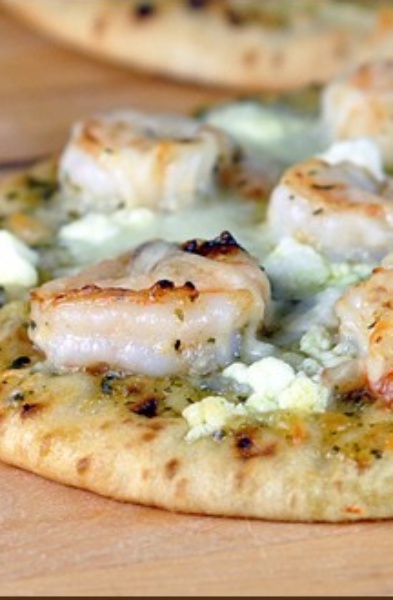 The goat cheese is what takes this pizza from yummy to absolutely dreamy. Place your crusts on nonstick baking sheets. Evenly distribute and spread the pesto over each crust; set aside. Coat the shrimp with the olive oil and then sprinkle with the garlic and some salt and pepper. In a large saute pan over medium-high heat, sear the shrimp for about 1 minute, flip and cook for another 30 seconds.